Packaging is good is good. It comes in a sqeeze tube which is quite easy to squeeze. This tube size is small so you could carry it anywhere in a clutch. The tube color shows the color that is inside it so this means it is, no doubt, easy to search in your makeup bag. It is leak proof which means that it is travel friendly. Its applicator is soft. You could easily apply lipstick with its slanted tip. The ‘Mad Blood’ shade looks like having a wine shade. Plum wine color shade to be specific. Perfect for regular use. ‘Mad Blood’ suits all skin tones. The wine shade would surely brighten up the complexion. This gives a matte finish to your lips. No shimmer at all. Fragrance is like a sweet candy. You will love it! It also spreads easily because it has a creamier kind of formula. Does not look patchy. Please do carry a lip balm to moisturize lips after few hours of application to moisturize your lips. Best is to first apply a lip balm beneath this lipstick so that your lips will be moisturized as well as have a nice and smooth color on top of it. ‘Mad Blood’ lipstick does last long. Super long infact. Around 6 hours to be precise. After a meal, it does fade a little. So reapply after meals. At the end of the day, remove this using a good makeup remover. Would I repurchase Maybelline Color Jolt Matte Intense Lip Paint Mad Blood? 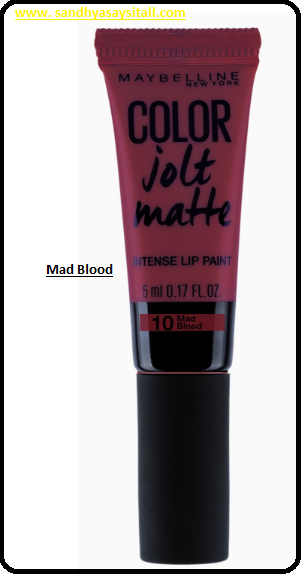 Would I recommend Maybelline Color Jolt Matte Intense Lip Paint Mad Blood? Yes definitely! Worth of its price!